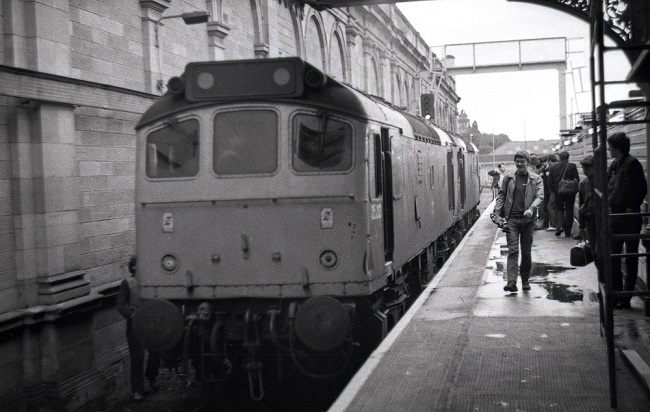 Photograph courtesy Richard Howatt 25213 & 25089 at Edinburgh Waverley on July 8th 1985 having arrived with a special. London Midland, Eastern & Scottish depots were the home of D7563/25213 during its twenty one year four month career. Time between last Classified repair and withdrawal: 109 months. Time between withdrawal and scrapping: 45 months (at least one cab lingered a little longer). April 1967 to London Division (D01). July 1968 to Preston Division (D10). October 1969 to Birmingham Division (D02). May 1971 to Nottingham Division (D16). 25213 was the 318th Class 25 withdrawn. After withdrawal 25213 was stored at Kingmoor making brief inspection visits to Upperby during August & November 1988 prior to being dragged to Crewe by November 30th 1988, then Toton and Leicester stabling point by December 15th 1988. Vic Berry's yard was reached by December 19th 1988, it remained intact until December 1990, by the end of the month most of 25213 was no more, one cab did linger into January 1991. Whilst dumped at Vic Berry the No.1 cab showed '7676' through the fading paintwork. Noted Derby Works February 1978 (Classified & dual brakes fitted). D7563/25213 acquired a passenger mileage in excess of 6,300 miles, no doubt helped by its time allocated to Toton and the Nottingham Division. The first recorded passenger working took place on July 9th 1966 with the summer dated roundtrip Nottingham - Llandudno Town with 5291. On November 12th the Duke of Edinburgh travelled from Manchester to Birmingham, the four coach special powered by 216 & 233. The train stayed overnight at Berkswell requiring the use of 7563 from Coventry onwards. On June 6th a Whitemoor - Chesterton Junction special freight and a return Cambridge - Whitemoor special freight were worked by 7563. The next recorded passenger workings took place in 1972, on May 27th working a Derby - Yarmouth to Norwich with 7550 and on June 24th with the 12.05 Scarborough - Leicester forward from Nottingham. On July 28th 7563 & 7564 worked the 08.00 Walsall - Yarmouth to Norwich. The Heaton - Red Bank empty vans were worked by 25213 on December 11th. 1977 produced a number of east coast resort workings. On May 5th 25213 worked the 12.36 Birmingham New Street - Norwich, these services were diagrammed for Class 31s provided by March depot. The summer months saw 25213 active on the summer dated seaside services. On June 11th 25213 & 25214 worked the Derby - Norwich - Yarmouth - Norwich - Derby (not Walsall) diagram. The next day (12th) the same pair worked a roundtrip Leicester - Skegness service. On June 25th 25213 & 25107 worked the Derby - Norwich - Yarmouth - Norwich - Derby (not Walsall) diagram. The next day (26th) the same pair worked a Nottingham - Skegness roundtrip charter. On July 10th the 09.15 Derby - Skegness and the return 18.15 Skegness - Derby were worked by 25213 & ?? The 08.24 Leicester - Skegness and the return 18.30 Skegness - Leicester were worked by 25213 & 25122 on July 26th & 27th. On August 13th 25213 & 25126 worked the 09.19 Manchester Piccadilly - Yarmouth from Sheffield to Lincoln Central, having replaced 47276, then returning with the 09.15 Yarmouth - Manchester Piccadilly from Lincoln Central. The same pair then worked a Leicester - Skegness round trip on August 14th/15th/16th. 25213 was stabled at Bristol Bath Road on May 6th. 1978 was a little quieter than 1977 for passenger workings, commencing on May 27th with the roundtrip Nottingham - Llandudno Town. A month later on July 26th 25213 & 25113 worked a roundtrip relief Nottingham - Skegness. It was a rescue job on August 19th when 25213 & 25158 took over the 14.30 Yarmouth - Walsall at March, replacing 40068, which is believed to have replaced a pair of Class 25s at Norwich. The stock off the 07.25 Plymouth - Edinburgh was cleaned externally at Craigentinny but then forwarded to Stirling for internal servicing, normally handled by a Haymarket Class 26, however on September 7th Springs Branch based 25213 made the trip. On April 26th visitors to Norwood Junction were 25178 & 25213, bringing in a Liverpool FC football charter for a Crystal Palace game, the Class 25s having taken over at Mitre Bridge Junction. The eleven coach Western Region Emergency Control train, for so long a fixture at Craven Arms was towed away by 25213 on May 17th towards Severn Tunnel Junction for eventual disposal. Most of the eleven vehicles were sold into preservation, however a couple of the generator coaches were retained by BR. The experimental railbus LEV 1 (RDB975874) was trialled between Westerfield and Saxmundham & Ipswich and Lowestoft during early June. The machine had arrived from Derby on June 2nd behind 25213 and returned on 12th behind 40052. On the morning of September 1st 25213 & 25178 worked the 01.28 Whitemoor - Temple Mills freight and most likely returned northbound with the 06.00 Temple Mills to Whitemoor. The next day (2nd) 25213 came to the rescue of the 17.05 St. Pancras - Derby at Wellingborough after the Class 45 was removed with a broken window, 25213 taking the train through to Derby. It was railtour duty on November 23rd with 25213 & 25175 working the Worcester Locomotive Society's 'The Yorkshire Terrier' between Dalston West Junction & Birmingham New Street. A couple of workings in the north-west took place during May/June 1981. On May 28th 25213 worked the 16.29 Preston - Liverpool, on June 23rd a Euston - Blackpool North was worked forward from Preston by 25213 (after 47430 had failed?) whilst on June 27th 25213 worked the 17.07 Blackpool North - Crewe to Preston. A weedkiller spray train was noted between Appleby and Long Marton on June 1st with 25213 hauling with three tankers and four bogie vehicles, the last being an ex-Gloucester R.C.& W. driving trailer. 25213 & 47430 were noted at Poulton-le-Fylde with an unknown passenger train on June 28th. 25213 received an 'E' examination at Crewe diesel depot during June. The Stanlow – Heysham Harbour oil tanks was in the hands of 25050 & 25213 on July 13th. The first week of August saw 25213 & 25218 on a typical London duty, the nightly motorail duty from Kensington Olympia to Willesden, so noted on August 3rd - 7th. A slightly longer adventure took place on August 9th with 25213 & 25208 working a round trip Northampton - Morecambe mystery excursion, a total of 303 miles. More motorail workings took place on August 22nd/25th with 25205 and September 23rd with 25196. In the early hours of November 21st 25213 was at York on Parcels duty whilst on November 27th 25207 & 25213 worked the Leith - Heysham pipes. During early February 25213 was noted at Reddish receiving attention to collision damage to the cabside at the No.1 end, including a repaint of the damaged areas. 25213 was noted westbound at Guide Bridge with a lengthy freight on February 12th (no damage to No.1 cab at this time). 1982 brought a modest selection of passenger workings, starting out on June 26th with 25086 on the 07.38 Shrewsbury - Aberystwyth returning with the 10.07 Aberystwyth - Euston to Wolverhampton. 25213 & 25050 were stabled at Willesden on July 24th. The middle of August proved a busy time for 25213. On August 10th 25213 & 25181 worked the 06.38 Bedford - St. Pancras, two days later (12th) the 17.05 St. Pancras - Derby failed at Leicester behind 45131, which was dragged to Derby by 25213. On August 14th 25213 & 25157 worked the Derby - Norwich - Yarmouth - Norwich - Derby diagram. And on September 18th 1982 two Preston - Blackpool North turns were worked by 25213. 25213 was stabled at Tyseley on October 30th. Photograph courtesy Tony Sayer 25213 seen at Toton on November 13th 1982, with the patched up cabside damage. 25213 was noted passing Roby station with an eastbound consist of four wagons February 10th. On May 10th 25213 & 25178 worked the 4E78 Stewartby - Kings Cross fletliner. Visitors to Exeter on the bitumen tanks from Ellesmere Port included 25213 & 25210 on June 1st. For the number crunchers there were now big blocks of scrapped/withdrawn machines including 25096 – 25106, 25128 – 25144 & 25162 – 25172, the largest continuous numerical batch of operating machines still remaining was 25205 – 25213. On July 12th 25213 worked the 6T51 Bordesley - Bescot DSS, comprised of loaded cartics. The passenger workings for 1983 were all connected with the West Coast main line. On August 7th 25213 & 25324 provided assistance to two services between Rugby & Bletchley whilst the power was off. 25213 & 25059 were noted at Warrington Arpley on September 29th. The loss of power at Hemel Hempstead on December 20th saw 25213 assist the 13.00 Bletchley - Euston throughout, dragging 310091 & 310093, returning north later in the day with the 16.00 Euston - Bletchley, both these services were additional trains. A short working on January 4th saw 25213 assisting the 13.00 Euston - Blackpool North as far as Willesden due to the power being off. On May 5th the 09.34 Blackpool North - Euston was worked to Preston by 25213. The remainder of the passenger workings for 1984 were all in the north-west following 25213's transfer to Crewe during January 1984. 25213 worked the 17.35 Blackpool North - Manchester Victoria on August 10th. Three days later (13th) the Ditton BOC - Broughton Lane tanks were hauled by 25213 & 40192. On August 16th 25213 & 25054 worked the 10.40 Carlisle - Leeds and the 15.55 return. On August 24th the 18.38 Blackpool North - Birmingham New Street was worked to Preston by 25213. The 6V32 Ellesmere Port - Severn Tunnel Junction was worked by 25235 & 25213 on June 15th. The lengthy 6S78 18.10 Severn Tunnel Junction - Mossend was noted at Newport with 25213 & 25051 on July 6th. 25213 passed through Carlisle station on August 4th. 25213 was stabled at Preston Ladywell sidings on August 8th. 25213 worked the 17.35 Blackpool North to Preston on August 10th and had presumably worked the balancing inbound turn. 25213 & 25054 worked the 10.40 Carlisle - Leeds passenger on August 16th. 25213 & 25145 were noted southbound at Crewe with bitumen oil tanks on November 29th. A Bristol – Manchester empty coaching stock working was noted on January 19th behind 25194 & 25213. On January 22nd 25208 & 25213 were heading south light engines at Redhill tunnel. On January 28th 25213 worked the 6F82 12.26 Chorley ROF - Warrington Arpley Sidings Speedlink Service. 25213 was noted at Derby with brand new 151001 on a wintry February 8th, the next day (9th) it was stabled on London Road curve, Derby and was stabled at Bescot on February 23rd. 25213 & 25230 worked the 6L38 Stanlow - Dalston tanks on February 26th. The train conveyed 18 TTA = 32 SLU and weighing in at 1056tons. On March 1st 25213 was stabled at Carlisle station. 25213 was noted at Toton with four merry-go-round wagons and a brake van on April 24th, presumably a local trip to get the wagons to/from the repair shops. 25048 & 25213 passed through Leeds on May 9th with westbound bogie oil tankers. 25213 was stabled at Severn Tunnel Junction on May 25th. The latter half of 1985 brought a mixed selection of passenger workings. On June 18th 25213 handled the 21.42 Preston - Liverpool portion of the 18.15 Glasgow - Manchester. 25213 & 25089 were noted southbound at Crewe with aspecial of loaded bogie oil tanks from Stanlow to Ironbridge on July 1st. North of the border on July 8th 25213 & 25089 worked 13.50 Birmingham New Street - Edinburgh relief forward from Carstairs. On the late afternoon of July 11th 25213 & 25200 worked a Tyne Yard - Carlisle speedlink freight. On August 27th 25213 worked the 20.48 Crewe - Cardiff. On September 15th 25213 was stabled at Severn Tunnel Junction. About a week later on September 21st 25213 was on display at Landore Open Day. By October 3rd 25213 was back in the north-west working the 18.15 Glasgow Central - Manchester Victoria forward from Preston. On October 4th 25213 was the Manchester Victoria station pilot. 25213 was busy north of the border on October 9th, starting out with the 12.40 Carlisle - Glasgow Central, then covering for a failed diesel multiple unit on the 16.35 Glasgow Central - Girvan and 18.30 return. 25213 was stabled at Thornaby on October 13th. 25213 was noted at Toton on October 18th. 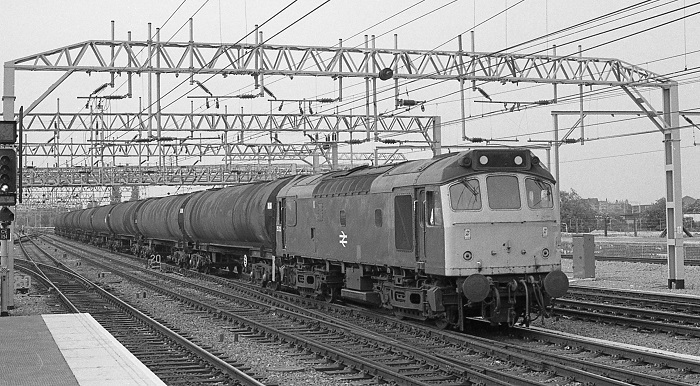 October 22nd’s sand train from Oakamoor hauled by 25058 & 25213 became derailed north of Stoke on Trent station. 25058 ended up overhanging the street, kept from falling by its attachment to 25213! The errant Type 2 was returned to the rails the following day. 25213 was noted at Severn Tunnel Junction on November 9th. Finally for 1985, on November 19th 25213 rescued the 08.52 Cambridge - Birmingham New Street from Manton Junction to Leicester following the failure of the diesel multiple unit. This service was terminated at Leicester. 25288, 25313, 31156, 31242 & 31234 passed through Water Orton and took the Nuneaton line on March 22nd. On a very wet March 29th 25213 was stabled at Bescot. 25213 worked the 07.09 Holyhead - Cardiff as far as Crewe on May 29th and was later noted that day southbound at Nuneaton with a lengthy train of ballast empties. On June 2nd 25213 was noted at Witton having arrived with the 7G42 12.55 Leek Brook Junction to Witton and to return with the 7K10 19:03 Witton to Longport Pinnox Sidings. 25213 was stabled at Stoke on Trent station on June 3rd. 25213 passed through Radway Green on June 12th. 25213 was noted at Crewe depot on June 15th. Photograph collection of webmaster 25213 southbound at Crewe with oil tankers on June 25th 1986, believed to be the 6V65 Ravenhead to Robeston tanks. 25213 was noted at Hereford with the 6V65 Ravenhead to Robeston oil tanks on June 25th. The 15.40 Euston - Aberystwyth required the use of 25213 from Shrewsbury to Aberystwyth on August 5th 1986 when the booked locomotive, 37430 was failed with defective brakes. The next day (6th) 25213 worked the 07.22 Aberystwyth - Euston to Shrewsbury. On August 23rd 25213 was stabled at Bletchley surrounded by at least four of its junk Class 31 replacements. 25213 was stabled at Manchester Victoria on October 11th. When the 18.03 Liverpool - Newcastle failed at Astley Level Crossing on October 22nd behind 45113, 25213 dragged the train to Manchester Victoria where 31424 took over. 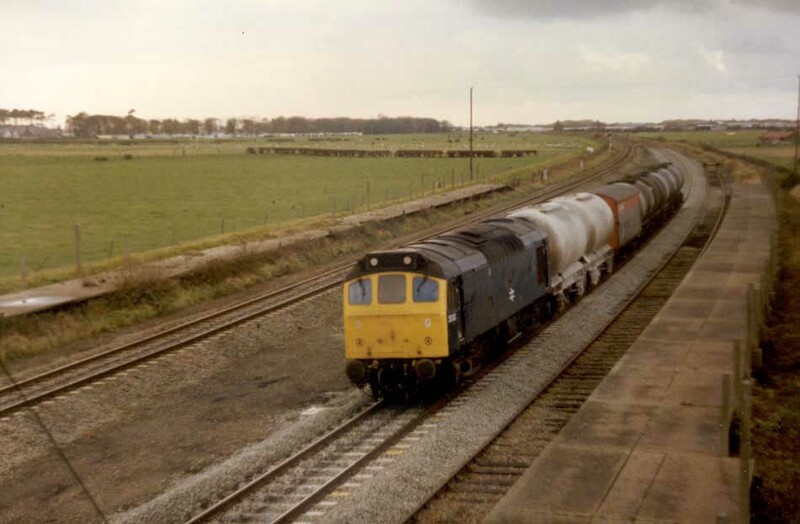 Photograph courtesy John Powell Eastbound 25213 passes through Talacre on an overcast November 11th 1986. 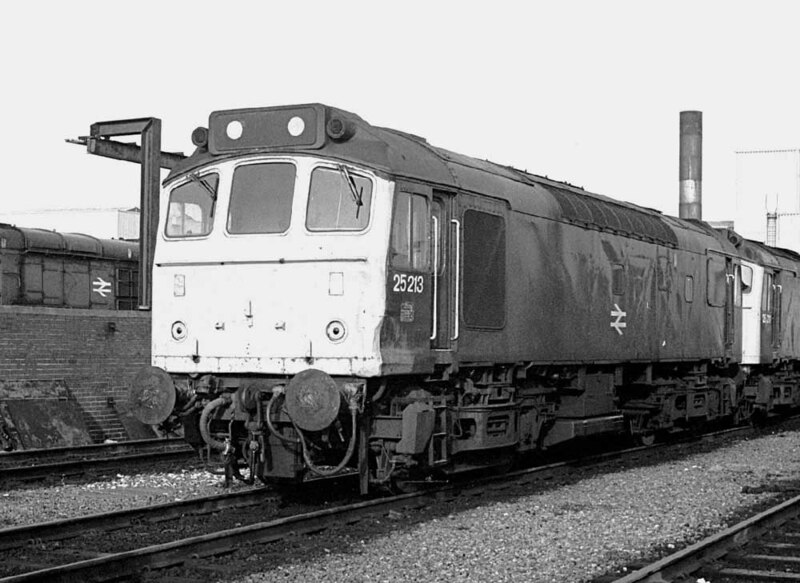 25213 would be one of the small group of Class 25's to remain in service until the end, March 1987. A visit to Llandudno Junction on December 6th found 31176 present for driver training, with three of the ‘old guard’ present, 25191, 25213 & 25903. Of these three 25213 was derailed with all wheels of the No.2 bogie on the ground. New Year's Eve found 25213 stabled at Stoke on Trent station. 25213 returned to the Cambrian line on January 27th 1987 to work the 07.22 Aberystwyth - Euston to Shrewsbury after the booked locomotive, 37430 was declared a failure after arrival at Aberystwyth the previous day. 25213 was noted at Hereford on February 6th & 8th, the latter date working a spoil train. The Aberystwyth - Stanlow oil tanks were hauled by 25213 on February 18th, the load was about twelve short wheeelbase tanks. The final passenger working for 25213 occurred on March 7th assisting the 07.20 Lancaster - Leeds from Carnforth following the failure of the diesel multiple unit. At lunchtime on March 12th 25213 was at Carlisle. March 15th, the last official day of service for the Class 25s, in Scotland were 25059 & 25213. 25213 was withdrawn on March 19th 1987. No.1 cab driver's side lower corner: dent & scrape - February 1982 until withdrawal. Carried stencilled name - at least February 1987 until withdrawal (Castell Y Waun Chirk Castle). Page added June 1st 2013.